The Blessed Oil has been blessed by Father Kevin McCracken and touched to a relic of Saint Catherine Labouré at the National Shrine of Our Lady of the Miraculous Medal. 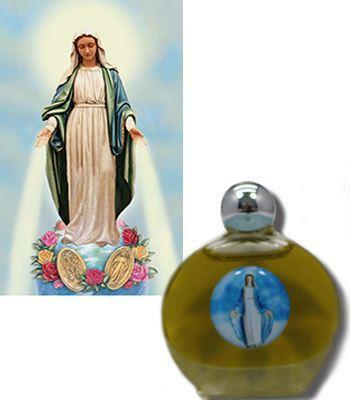 The oil comes in a 1/2 ounce glass bottle with an emblem of Our Lady of Grace. A Healing Prayer Card will also be included. The oil can be used to bless yourself, your children, grandchildren, or anyone else in need of Mary’s motherly care and God’s healing love. The oil can be used for any occasion, not just in times of illness or injury. You will be in our prayers and all of us at the Association of the Miraculous Medal will continue to pray for you and all of your intentions.